HG6 Styling Cream is a leave-in conditioning treatment that revitalizes damaged, chemically treated, dry, thin or frizzy hair. Also great for creating smooth braids. 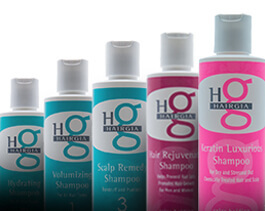 HG6 equalizes the porosity of hair and gives long lasting luster and shine while helping to thicken hair. It provides thermal protection and shine. DIRECTIONS: Apply a small amount of HG6 Styling Cream to dry or towel-dried hair, work through then blow dry, sculpt and style. Excellent for use on exceptionally dry and/or chemically-treated hair that is in need of extra conditioning and heat protection. 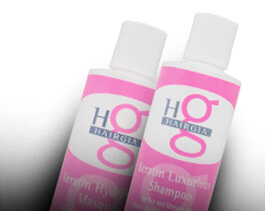 For best results, use after HairGia shampoo and conditioner and set your finished style with our Creative Hair Spray. When creating products at HairGia, we use only the finest ingredients, including natural botanicals, and we never test on animals. It is our goal to produce products that are great for your hair and good to the environment. A family run company, HairGia is committed to excellence in hair care. If you have any questions, comments, or concerns please contact us online.